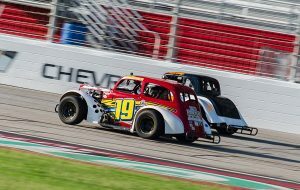 Legend cars returned to Atlanta Motor Speedway’s Thunder Ring on Saturday. HAMPTON, Ga. – The first day of the Furious Five series was jammed full of racing action, with double features to start off the series. After navigating the twists and turns of road courses for the final events of the previous series, the drivers in Atlanta Motor Speedway’s Legends program returned to the quarter-mile Thunder Ring, kicking off the Furious Five with tight, bumper to bumper racing. Taylor Jorgensen started third in the first Pro Legends feature, but wasted no time getting to the front. After lap one she was up to second, and by lap three she had taken the lead from polesitter Cody Hall. From there, Jorgensen never looked back, pacing the final 18 circuits on her way to victory. Starting from the pole in the second Pro Legends feature, Jorgensen took off from the field and didn’t look back, cruising to her second win of the day. Cale Hall finished second, while Cody Hall recovered from an incident at the start to finish third. Nick Woodall and Audrie Ruark put on a show in the first Semi-Pro Legends feature. Ruark won the pole and led the first lap, but Woodall was able to scoot by her to take over the lead on lap two. After that, Ruark stalked Woodall every lap, looking for an opportunity to pounce and re-take the lead, but Woodall never slipped and held off each challenge to take the win. The pair picked up right where they left off when the second Semi-Pro feature began. Throughout the 20-lap feature, Ruark hounded Woodall looking for a way by, but Woodall never flinched. Woodall held off Ruark to take his second win of the day. Plemons didn’t slow down in the second Masters feature, though he did have to hold off a few challenges from Swan shortly after restarts. 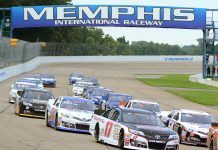 Nonetheless, Plemons held serve for all 20 laps, sweeping both Masters feature wins from the pole. 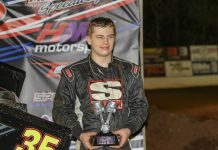 Timothy Watson showed the way from the pole position in the first Young Lions feature, despite having Nathan Jackson right in his tire tracks the entire way. Watson stayed flawless on a restart with two laps to go and held on to win the feature. In the second Young Lions feature, Jackson snatched the lead away from Watson for a lap, but Watson found a way back by quickly and never looked back. Watson took his second feature victory of the day, while Jackson settled for second. While others found trouble behind him in the first Outlaws feature, Mason Maggio cruised at the front of the pack, fending off a pass attempt by Kenny Brady on the final restart to get the win. In the second Outlaws feature, Brady hounded Maggio throughout, nearly completing a pass for the lead before an untimely caution ended the attempt. However, Maggio was able to defend his position throughout and held off Brady to complete the sweep. The first Bandits feature saw bumps and paybacks. After leading the first 12 laps, Carter Griffis was muscled out of the lead by Garrett Gumm. Three laps later when Griffis returned the favor, the contact sent both cars spinning. Their misfortune opened the door for Kyle Bacon, who held on to win. Griffis recovered in the second feature, taking the lead from Bacon on lap three and leading the rest of the way to win. Bacon slid to third in the second feature, surrendering second to Bryson Matthews. In the first Rookie Bandoleros feature, Gianni Esposito picked his way through lap traffic with patience and precision, allowing him to hold off hard charges from Briana Freeman and Kristen Holland. Esposito and Freeman went to battle in the second Rookie Bandolero feature, this time crossing the stripe door to door as the checkered flag flew. Esposito narrowly edged out Freeman to sweep the day’s features.